How do I edit an existing contact or add a new contact for sport? 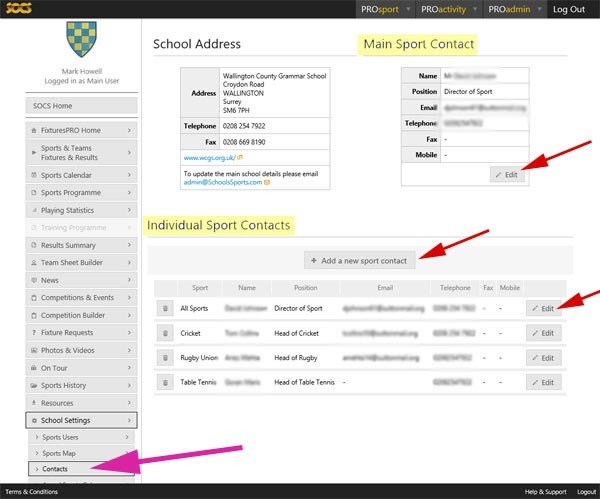 From the main left hand menu select School Settings > Contacts (as indicated by the purple arrow in the illustration below). To add new or edit existing contacts click the appropriate button indicated by the red arrow in the illustration below. The Main Sport Contact appears on the home page of the sport website. Individual Sport Contacts appear on the Sports Contacts page of the sport website. If changes are needed to the School Address then send an email to support@miSOCS.com.